Creating a landing page for your website can be tedious work. You would have to gather images to use and you might have to hire people who are experts at UI web development. You’re also going to need a reliable landing page template, or tool, which will help you in the process. Searching for the right type of landing page tool is probably the most difficult task when it comes to building landing page themes. As the saying goes, “The first step is always the hardest,” and this is especially true in this case. That’s why we’ve prepared 30 of the best WordPress landing page tools to help you make a good start. 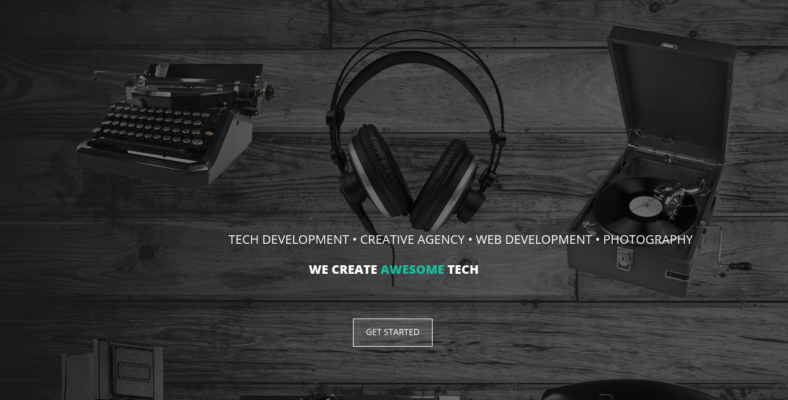 Actema is a multipurpose WordPress theme that has a Slider Revolution feature. Slider Revolution is the most popular slider and it has very good animations as well. It has Visual Composer, too, which lets you build any type of layout that you like. The composer has a drag-and-drop feature, making the whole process of building a landing page free, easy, and simple. But no matter how good a template is, it’s perfectly normal to encounter bumps along the way and experience some technical issues. The theme’s friendly support team is readily available and has been trained to handle whatever concern you have for them. 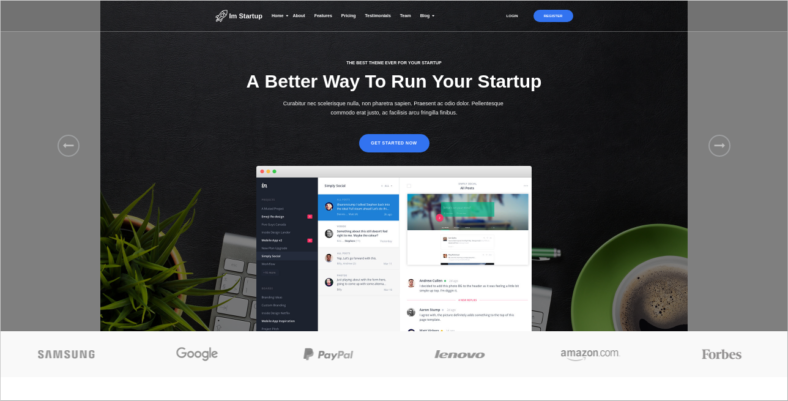 ImStartup is one of the many WordPress themes for startup efforts and it was specifically created with landing pages in mind. Getting yourself a reliable startup theme is very important, especially because the startup phase is the most crucial stage of developing a website. The template in question has a total of seven slider options that its users can choose from and has valid coding like CSS3 and HTML5 for its animation. You also won’t have to worry about the type of browsers your site visitors are using because it has cross-browser compatibility, efficiently improving its accessibility on numerous browsers. Without a doubt, Swanxy is certainly a stylish WordPress theme on this list and you will soon find out why. It has three footers, seven headers, and a drag-and-drop builder, on top of having dynamic and static elements. Furthermore, it has a Live Customizer, allowing you to make and view changes in real-time, without having to refresh the page. It is equipped with a set of Cherry plugins, which you could use to improve the quality of your landing page, making it more fascinating. This one is also SEO-friendly, which helps your landing page gain more viewers since it is in the top rankings for search engine results. 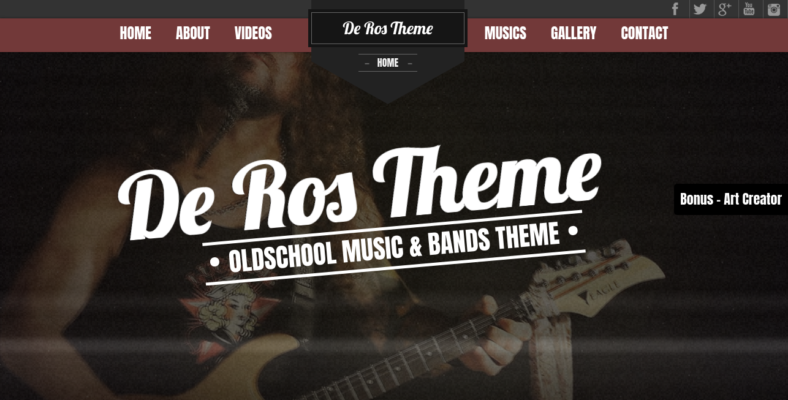 If you are looking for a WordPress music template that would be able to help you create an impressive landing page for your band, then you should definitely give DeRos a spin. It has a responsive design, which means you won’t have to worry about the type of device your visitors are using because your site would be compatible with most of them. You can create the “About” section and highlight your band’s story, and the tour dates and gigs using the Events Calendar, and integrate videos from YouTube, as well as audio files using the built-in music player. 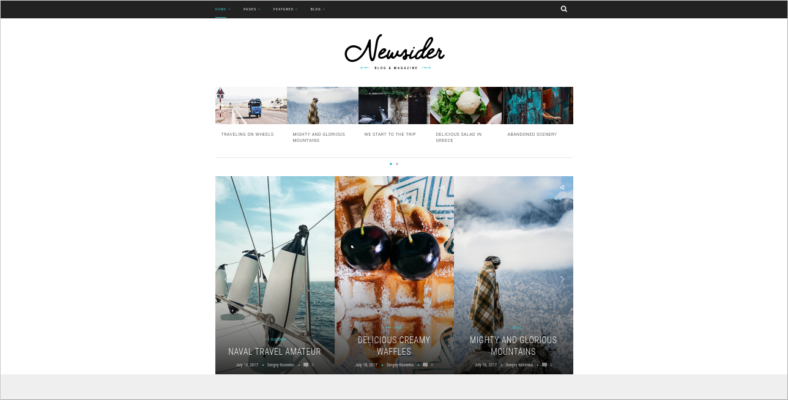 Newsider is a magazine WordPress theme that is perfect for travel and fashion bloggers but can also be used for other purposes. It can be for a food, news, or politics website, which proves that this theme has multipurpose capabilities. One of its features is its flexibility, allowing users to create their ideal website, no matter what kind of webpage it is. This means that the template is capable of providing you with a compelling landing page. You can easily change the colors as well and make them fit your preferences. If you find that its fonts don’t look good, you can tweak it, too, and use a design that suits your taste. 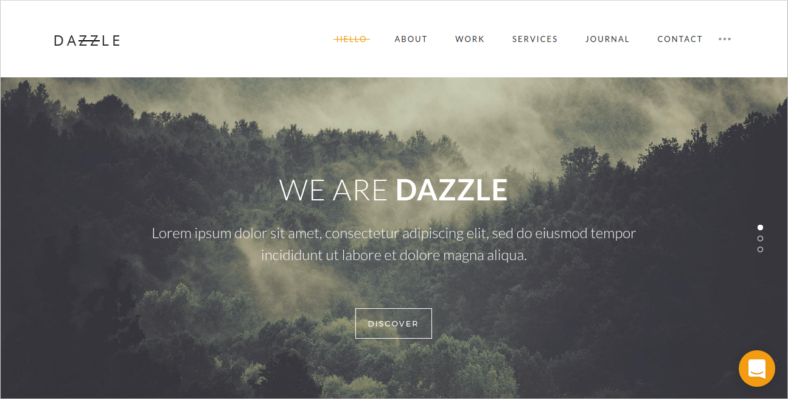 Dazzle is one example of an amazing portfolio theme that is available in the market today. It was made for creative individuals who specialize in the field of photography. It sports unique demo layouts that are enough to capture any potential user’s attention. It has powerful theme options as well, giving you the chance to further enhance the quality of your landing page. You get to use Parallax-like effects, too, which is very important for the landing page’s visual aesthetics, making it look more beautiful and compelling. Speaking of animation, it has on-scroll animated content, making the flow of scrolling up and down appear seamless and fluid, thanks to the CSS3 animation feature. The Galaxy is a salient WordPress theme because it is the first ever design-driven theme for WordPress. Being design-driven would mean that it mostly focuses on visual aesthetics, which is exactly what your landing page needs to attract and captivate people. The template has 50 custom page builder elements, has more than 670 Google fonts, and over 560 Ultrasharp Vector Icons. If you are into pre-configured page layouts, the theme has 40+ of them, which are designed for the Home, F.A.Q, and Blog Features section. It has Google Maps integration as well, which makes performing geological tasks simpler and easier. AvantWP is a creative theme for WordPress users who would like to release their artistic side on the landing page project that they are working on. One of the best features it has in store that can fully induce creativity is the Visual Composer, which is packed full of elements. It has more than 15 unique layouts that will truly get your creative juices running as you proceed with customizing the template to your liking. You would be able to present an elegant portfolio designs, too, thanks to the masonry layouts with animated category filters to further enhance the appearance of your site. 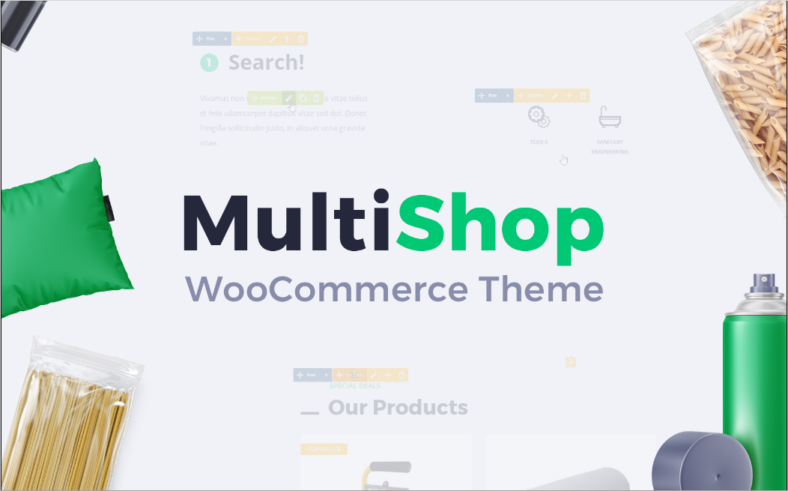 There is only a handful of business WooCommerce WordPress themes out there and Multishop is one of them. Its compatibility with eCommerce functionalities will definitely help your website generate profits. The template has a responsive design, which is good news for the landing page you are about to make because this would allow it to be viewed on different types of devices. You won’t have to worry about the installation process as well because it has been made simpler and easier; all it takes is a single click and you’ll be good to go. If you are looking for a mobile WordPress template that can efficiently create a beautiful landing page, then Jevelin might just be the one for you. 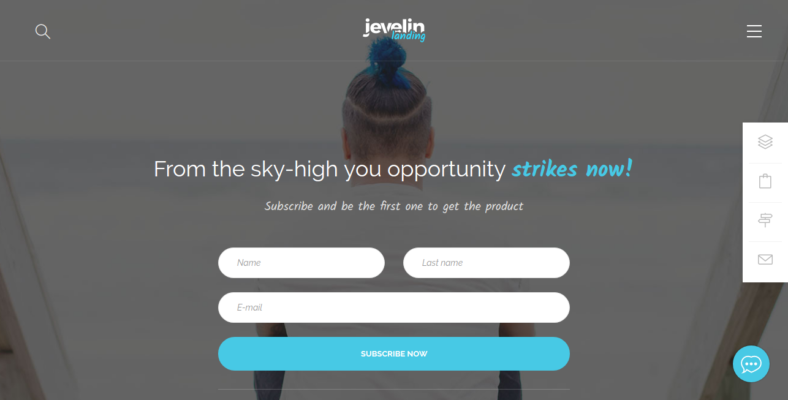 Shortcodes are some of the most important tools that any website theme can have and, with Jevelin, you get to choose from over 40 custom-crafted shortcodes that will help you customize the landing page to suit your preferences. It is Search Engine Optimization (SEO) ready and has Right to Left (RTL) optimizations, too, making it translatable to RTL languages. It also has the PHP Contact Form 7 plugin, which lets site visitors and customers get in touch with you so you will have the opportunity to interact with your audience. If you are looking for a business WordPress template specifically designed for freelancers and businesses, then you might consider trying out eStudio. It is important that you get to highlight specific contents of your site like a relevant article, or an intriguing story related to your business, and with the theme’s Featured Content Slider, you will be able to do just that in a very fluid style, thanks to the auto-scrolling slideshow provided by this feature. A plethora of shortcodes is made available for users to access as well. Nectar is a premium template that is jam-packed with features that would not only make things easier more efficient for you, but it would also encourage potential customers to visit your website. The theme’s code has been perfected by programmers to ensure that it follows the best practices of the industry. It has a bunch of other features as well such as a Contact Form 7, the amazing Slier Revolution, 4000 icons provided by Font-Awesome and IcoMoon, and compatibility with the best SEO plugin for WordPress. You can consider this a brilliant SEO WordPress theme that is equipped with numerous functionalities to ensure that it would be providing the best results. 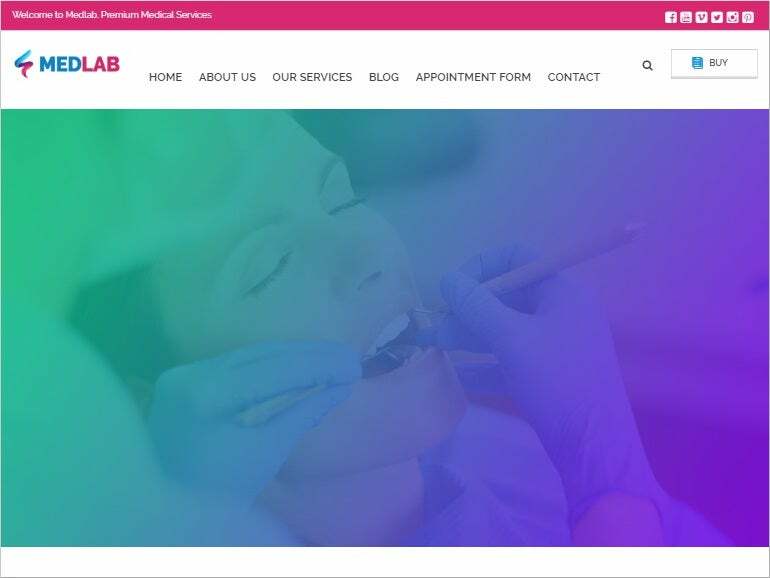 MedLab is a medical WordPress theme that can provide the landing page you are building with everything that it needs. The template is compatible with WordPress versions 4.0.X and above, which means the developers are consistently updating it to meet the proper standards. Its design has also been made responsive, making it viewable on any device such as a mobile phone, a desktop, or a tablet. It has the Visual Composer plugin, too, giving you the privilege to customize what the template looks like and make it match your preferences and concepts for the landing page. Hoxa is a responsive WordPress theme that has brilliant color variations, unique pages, and awesome slideshows. It is equipped with six different website layouts and one of them is for a landing page. It has Best Google Fonts compatibility, which means you’ll be able to tweak the theme’s typography and use the available options to make the template fit your concept of the website. It has over 100-page templates and is well documented with a cross-browser functionality. You will also see results and see changes in real-time, thanks to the Live Content Editing capability that the developers have integrated within the theme. WPCasa is a dynamic real estate WordPress theme that is perfect for those who specialize in the field of selling or leasing real estate properties. The template has a powerful header setting that allows its users to create compelling landing pages that are both captivating and functional. Widgets are very important when it comes to the total performance of your site, but there are times that using them can be challenging. Fortunately, the theme has easy-to-use custom widgets like newsletter boxes, galleries, call to action, and much more. You’d most probably want to customize the theme, which is another piece of good news because this one is very easy to customize thanks to the intuitive interface provided by the developers. With the number of bloggers consistently increasing all over the world, developers have been able to catch up on this trend and provide users with some WordPress personal blog themes. Ashleigh is one of the many blog templates out there and it is also one of the themes that would be able to provide you with great landing page tools. The logo, header, and background images are fully customizable and you can upload your own designs for them. It supports RTL languages and has cross-browser compatibility, too, perfect for increasing the chance of your site to be discovered by the general public. It supports numerous post formats too like the gallery, audio, and quote posts. 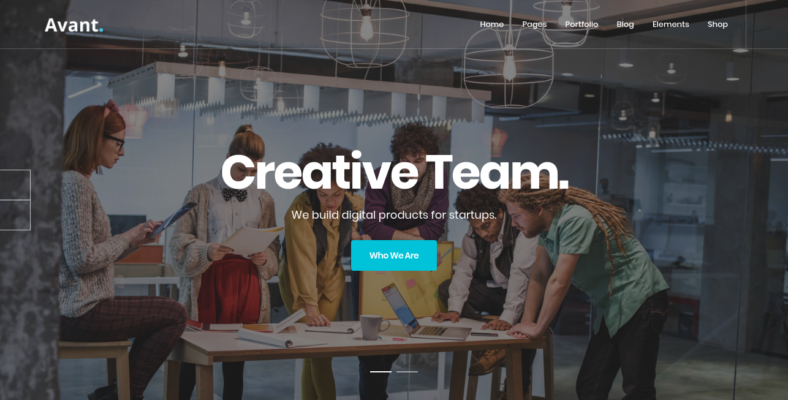 Creatica is one of the many advertising agency WordPress templates and is the perfect theme to use for creating a suitable landing page for advertising agencies. If you ever decide to get this one, you would get the chance to enjoy the numerous Kaswara Add-ons that have been integrated into the template. You get to use more than 550 Options and over 100 Elements. It has the Slider Revolution plugin as well, effectively increasing the level at which your site showcases the content you choose to put in it. The drag-and-drop Visual Composer would also come in pretty handy as it simplifies your work, letting you experience a less stressful and less time-consuming process. Stylish is one of the many clean and simple WordPress themes that you’ll be able to find floating around the Internet. However, its simplicity is not a hindrance because it is jam-packed with numerous useful features. One of the most helpful features that it has is its retina-ready design, which allows it to automatically adjust itself to fit into any screen size on any device. Its admin panel is also very powerful, giving you the chance to customize and make changes to the template that can enhance the overall quality of your website and its landing page. You get to choose from unlimited color schemes and numerous icons that have been provided by Font Awesome Icons. Start is a reliable one-page WordPress theme for anyone who is looking to endorse, advertise, and market their business. You won’t have to worry about the quality of your landing page if you use this one since it has been made to perfection by its developers. The landing page theme is based on Bootstrap 3.1.1., which is one of the most efficient frameworks in the market. It sports a retro style design and has Font Awesome 4.1.0 in its arsenal along with a filterable portfolio section, letting you organize the images that you’ll be putting in the gallery, sliders, and other content boxes. xFolio is a simple WordPress theme that has a variety of powerful features, making it one of the most efficient templates here on this list. With the many galleries, graphic/text carousels or sliders, and portfolios to choose from, the landing page you plan on making will definitely have amazing results. It has Google Maps integration as well, which makes tasks such as searching for an address. It also has the Contact Form functionality, which is very important because you never know when visitors might have questions for you. Communication between you and your target audience is very important and the Contact Form will serve as the most suitable bridge for the task. Interior designing can be quite a daunting task, which is why most people would simply go and find themselves a reliable interior designer. However, this time is different because you are the designer and you are the one trying to market your services. BlackWell will definitely provide your interior designing website with everything that it needs from highlighting your team members to showcasing the projects you’ve accomplished using a portfolio gallery. It has a bunch of other features, too, like letting you choose 10 different color options, so you could customize your web page. The Parallax effects would also be of great help for your landing page. 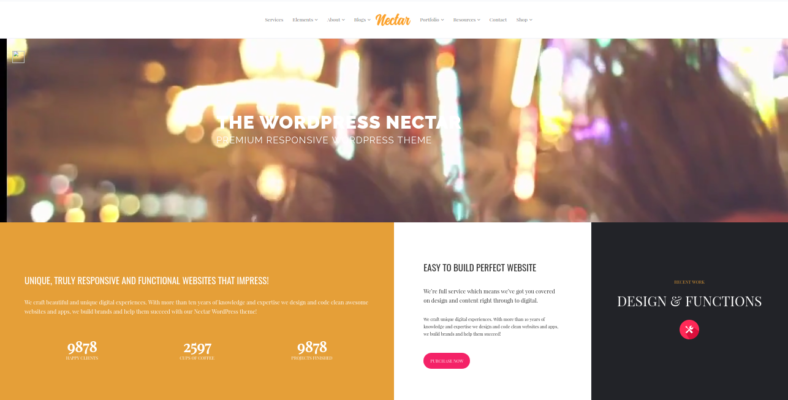 This is certainly a designers WordPress theme you should get. You can have your pick of any landing page WordPress theme that you can find by just simply searching the Internet. 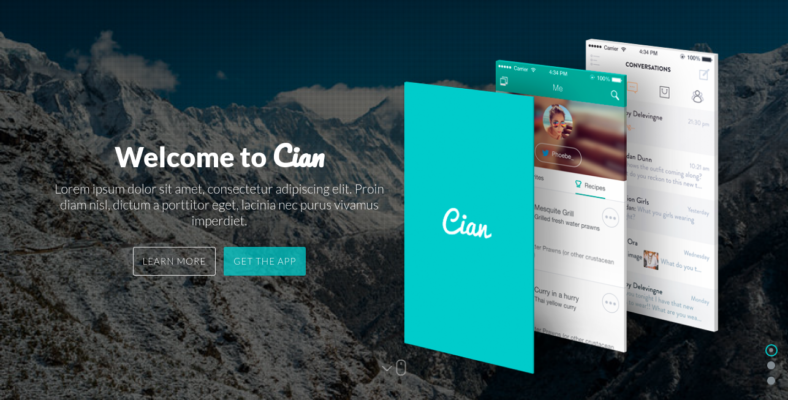 However, it would be difficult to find a theme the same as Cian, an app landing page. Being an app landing page, the nature of this template must always be responsive. It supports numerous types of post formats like video, audio, and gallery, to name a few. CSS3 animations are also readily available, along with 369 icons by Font-Awesome. It has two types of backgrounds—one is a video background and the other is an image slider—that you could choose from, depending on the concept you have for your website. In its fullest sense, Raindrop is a multipurpose theme. But with the high-quality visuals it provides its users, it is most commonly used for creating a photography website. Aside from the level of visuals, it can provide, it has numerous different features in store for its users. The template is retina-ready, which means your site along with its landing page would be able to adjust itself to fit into any screen size, on any type of devices, such as a desktop, mobile phone, or tablet. It also has Parallax backgrounds, Font-Awesome Icons, and more than 100 shortcodes. 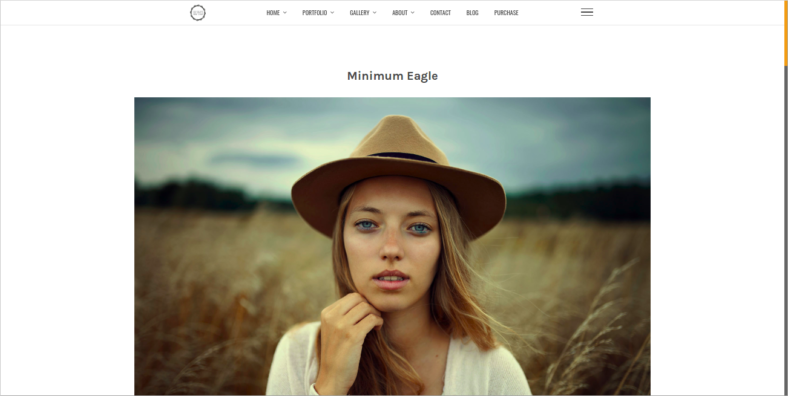 Your landing page will definitely look its best, thanks to this multipurpose photography WordPress theme. 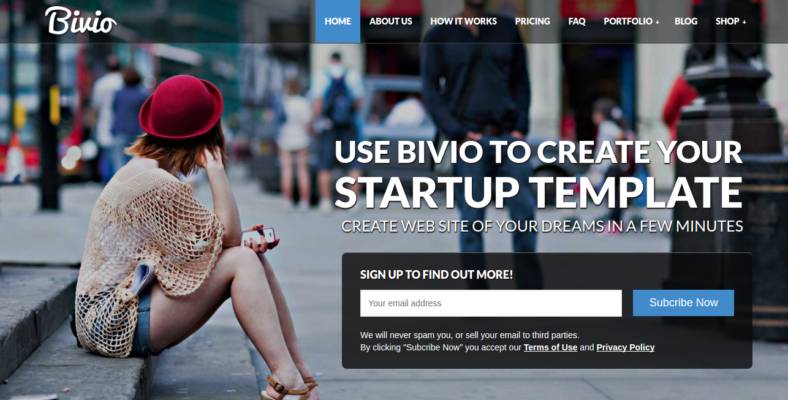 Bivio is another app landing page theme that has been designed specifically for WordPress users. It sports a drag-and-drop page builder and visual composer plugin, which lets you experience a less stressful and more enjoyable experience during the whole customization process of the template. It has WooCommerce compatibility, which means you can transform your web page into an online shopping site in only a matter of minutes. Powerful admin options, CSS3 animations, and Parallax backgrounds are other available features as well—all of which will definitely improve the quality of your landing page. It is also translation-ready, which means it is a multilingual WordPress theme that has a fully responsive design. Parallax effects are very important when it comes to landing pages. The reason behind this is the fact that landing pages are the first thing site visitors see and, if it doesn’t load smoothly or has a lot of glitches, visitors would be put off. It’s a good thing then that StartPoint is an elegant Parallax WordPress theme. Some of its features include a responsive design, filter effects supported by Wookmark, and Font-Awesome Icons. It has Parallax scrolling, perfect for that seamless scroll up or down transition, and it runs using the Bootstrap framework, which is one of the best performing frameworks for WordPress. 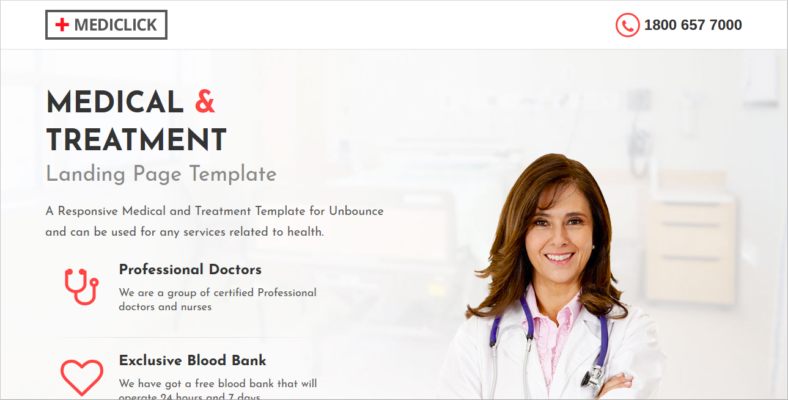 Are you looking for a reliable health template that would let you showcase your medical expertise and, at the same time, highlight the products and services you offer? Then Mediclick is the one you are looking for. 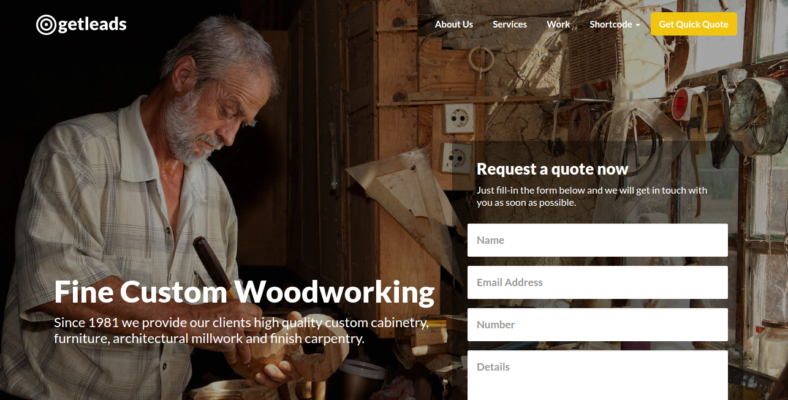 The landing page template is compatible with WordPress 4.8.X and later versions of it. It sports an advanced WordPress Live Customizer, which lets you make changes faster with less time consumption by making the process easier and more intuitive. You get to choose from an unlimited number of Google Fonts to help you change the typography and it has four homepage layouts you could use. Blackbird is a mobile WordPress template that would definitely help your landing page stand out on mobile devices. It has 10 different colors that users could choose from. It also has drop-down menus, which are important buttons that one could use to save up space on the site. Some themes only have a limited amount of these drop-down menus, but with Blackbird, you get to have unlimited numbers of it, which essentially means you can add infinite amounts of dropdowns on your site. There is also a Full Theme Photoshop Document (PSD) included here, which means you could save the design you’ve decided to apply and use it later. Getleads is one of the fastest WordPress themes when it comes to creating landing pages, that you could find out there. You’re probably asking why, and one of the reasons is due to the nine ready-to-use landing pages that come with the template. It has a Unyson framework but is also compatible with Bootstrap 3.X, and it has over 230 unique sections like blocks and features to help make your website look more compelling. With over 900 icons, you would have little to no issues about the availability of icons with this template. You have an unlimited pool of colors to choose from and, to top it all off, installation only takes a single click. Hipstech is one of the many digital agency WordPress themes available in the market. With this template, your landing page would be able to capture people’s attention and, at the same time, present what you have to offer. It has a four-column feature area, which gives you more than enough opportunity to highlight four of the best products or services you have for customers. Aside from that, it also has more than 10 blog pages, over 100 shortcodes, and 20+ portfolio templates. You get to use unlimited homepage templates, along with 10 header styles and a Parallax background. CSS3 animations are also available, giving emphasis to the site’s visual aesthetics. Hosting an event is a challenging task and it is pretty time to consume, too. There are a lot of other stuff that you should focus on during an event and be creating the landing page is one of them. 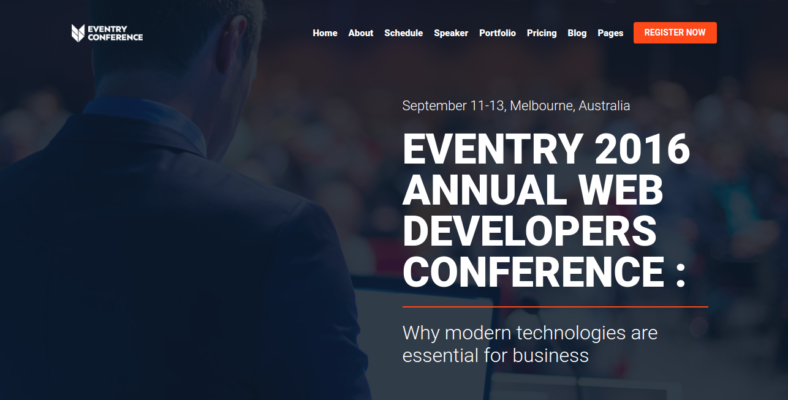 Eventry is an event WordPress theme and it will surely help you a lot with the landing page you plan on making. The theme has four home pages to offer and 10 predefined color schemes, some of which are orange, pink, and green. You can add an event countdown timer to your landing page as well, which is a pretty clever functionality provided by the template. The event schedule can easily be edited, managed, and changed if the need arises. People would mostly disregard the importance of landing pages, most probably because it doesn’t sound that important. However, they are the very first thing anyone visiting your site would see and it is their job to make a good first impression. But it wouldn’t be able to do its job without the proper tools. That’s where our list comes in handy. These themes have everything you need to create a website and an exceptional landing page that will leave people in awe. Whether it’s a free template or a premium one, the ones available here will certainly not disappoint you.